If you want a firsthand experience of San Diego’s legendary laidback lifestyle, Mission Beach can’t be beat. Cruise down the infamous Mission Boulevard until the road suddenly dead ends at the brink of the bay. Make sure to get there at sunrise to secure a parking spot in the always cramped lots. Don’t forget your walking shoes as you begin your day with a brisk stroll down this two-block wide, two-mile strip overflowing with pure white sandcastles and the most desirable real estate on the Southern California coastline. These envied residents have the best of both worlds as they awaken to the shining sun climbing SeaWorld’s steep roller coaster and fall fast asleep to the melodious waves of the Pacific Ocean. This portrait of paradise is separated by two rustic boardwalks most commonly used by locals to rollerblade, bicycle, and run. But most visitors simply sit and gape at the colorful array of beach dwellers that use these boardwalks as their own personal runway. “Slow Mo” is a daily fixture on the westside walk. The allegedly retired UCSD professor opts to rollerblade clad only in his trusty speedo and archaic walkman as he rolls by with his trademark slothful moves. Or gaze upon the central boardwalk’s very own roller skating club, whose members take turns performing a variety of innovative dance moves for the swelling crowd of spectators. You may also be lucky enough to catch a glimpse of one of the “Sandman” creations before the Pacific Ocean quickly swallows it whole. This seldom seen artist has been creating unique sand drawings along the beach for the past five years, but prefers to remain anonymous to his admirers. By now you’ve hopefully worked up an appetite for one of the shoreline’s heartiest breakfasts at The Mission Café and Coffeehouse. This hip, health-conscious eatery fuses traditional breakfast foods with imaginative ingredients, such as rosemary bread, granola banana pancakes, and roast beef hash. Although the service is quick and friendly, prepare yourself for a 60 minute wait at peak times on the weekend. Are you ready to burn off some of those calories? The southernmost tip of this shoreline is lined with hundreds of volleyball courts, displaying a wide range of skill level. On a good day you may catch a promising duo training for a professional tournament, or Pat Powers, the Olympic Men’s Volleyball Gold Medalist who still resides here. Keep your eyes peeled, and you might just spot an opening in a game to jump into and showcase your talent. When you’re covered in sticky sand and want to call it a day, what better way to rinse off than a quick dip in the soft surf of the sea? 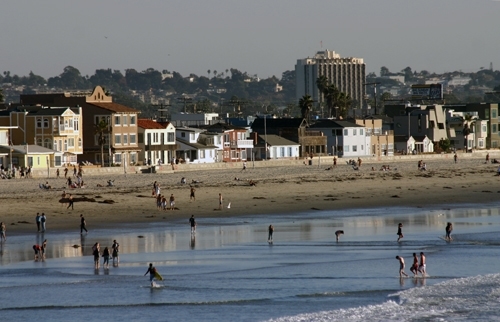 But if you’re more of a water rat, rent a surfboard and try your hand at the most popular pastime in San Diego. Endless Summer is a notorious surf school in the area that offers great deals for half day equipment rentals and surf lessons. Just make sure you learn the stingray shuffle before you paddle out; the local’s ritual of awkwardly wading into the water in an effort to uproot any harmful stingrays resting in their path. The Wave House is the newest addition to Belmont Park, the historic heart of this sleepy beach town. But Belmont Park is not your typical tree-lined playground flocked with families and picnic baskets. Rather, it is a seven-acre beachfront amusement center with picturesque scenes of playful dolphins surprising startled surfers. Belmont Park is home to the centerpiece Wave House and world famous Giant Dipper roller coaster. The Wave House offers guests a marvelous menu of activities for the day, including an athletic club, retail shops, an Olympic size swimming pool, fitness classes, an outdoor beach bar, and a new simulated wave machine. For all you thrill seekers, don’t forget to ride the half-mile long Giant Dipper. This attraction was built in 1927, and is one of the oldest wooden coasters in operation. But not for the weak at heart! This one is startlingly steep and quick. This action-packed day will surely cause some hunger pains by lunchtime, so head to World Famous for their famed surfside lunch. Dine on lobster bisque, Maui grilled shrimp salad, or their popular beach burger while entertained by the skilled kite surfers in hopes of learning a trick or two. It’s almost sunset and time for a serene stroll down the Crystal Pier. It’s hotly debated if the popular pier stands in Mission Beach or the bordering beach town of Pacific Beach, but nobody can contest its magical ability to reveal the most breathtaking sunset in Southern California. On your trip down the pier, you may catch a rare glimpse of a whale during prime season from December to March, or a local fisherman proudly pulling in a perch for that night’s dinner. For a truly unique sunset experience, keep staring at the setting sun for the legendary Green Flash. The flash is a legendary phenomenon that surfers claim to spot when part of the sun suddenly changes color at moderate latitudes as it dips below the horizon. Finally, finish your day off with a delicious dinner at the award winning Atoll Restaurant in the Catamaran Resort Hotel. This five star kitchen offers guests an exotic dining experience complete with an unbeatable bayside view. After dinner, make sure to walk through the hotel’s tropical pathway overflowing with colorful animals and plants as you make your way to the waterline to wrap up your day with one final romantic stroll in the memorable moonlight of the brilliant bay. Directions to Mission Beach: From the North take I-5 South to Sea World Drive. Follow the signs to West Mission Bay Drive. From the South take I-5 North to Hwy. 8 West. Follow the signs to West Mission Bay Drive.